Having a missing tooth can lead to long-term problems and it can affect you mentally as well. People, who have lost their tooth, fail to understand that modern dentistry utilises innovative treatments to restore the normal function, comfort, aesthetics and overall health of patients with missing tooth. Among all other tooth restorative options, dental implants are considered to be the most effective treatment and permanent solution for a missing tooth. Even though dental implants are expensive, they have a higher success rate than bridges and dentures. However, many consider only the dental implants cost in Sydney but fail to recognise the long-term benefits of teeth implants. Do you know that the impacts of missing tooth are more extensive than you think? You might have lost your teeth due to various circumstances, but what happens if you do not fix it? Read to find what all are the impacts of living with a missing tooth. You exercise daily to help keep muscle tone; the same thing goes with your jawbone as well. The jawbone mass is preserved when you stimulate through biting and chewing. If you do not replace your missing tooth, the area where your tooth stood will no longer receive the same amount of stimulation and will begin to disappear. So what is the solution? Do you think you can fix it with dentures? No, actually dentures reduce the jaw bone quality. Replacing your missing tooth with the cheap dental implants Sydney can help preserve the jawbone and maintain your facial structure. 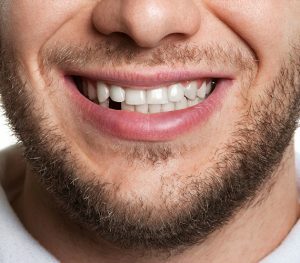 If you do not have an adjacent tooth, the neighbouring teeth will begin to shift into the gap created by your missing tooth. The migrating teeth will also destabilise the roots of the adjacent teeth. Undoubtedly, the only solution to avoid this problem is to replace it with dental implants. Actually, your facial structure depends on the structure of your teeth. When you live with a missing tooth, the facial muscles can begin to droop and cause a change in your appearance that can mentally affect you by losing confidence. We all of us have 32 teeth, and each tooth has got its own function. If you are missing a tooth in any molar, the load of the function becomes more on the adjoining once. This leads to more wear and tear of the adjacent which causes sensitivity and bone fracture. It is obvious that if you have a missing tooth, you will have trouble in speaking as well as chewing your food. Over time, digestion can also be affected since your mouth cannot break down foods. Hope now you are clear about the impacts of living with missing tooth. Get affordable dental implants in Sydney today and stay healthy.